The theme is hand crafted in such a way that it can be adapted by anyone. Creatives, design studios, programmers, digital agencies, product based companies, service based companies, startups, cloud based services, mobile app based companies. Exhaustive HTML Documentation/self help tutorials that includes everything from changing colors to tweaking features. BONUS DOCUMENTATION - How to upgrade to future versions of Bootstrap. Yes, you read it correct. This theme is future proof. The documentation includes step by step tutorial with screenshots and links to upgrade this theme to future versions of Bootstrap. 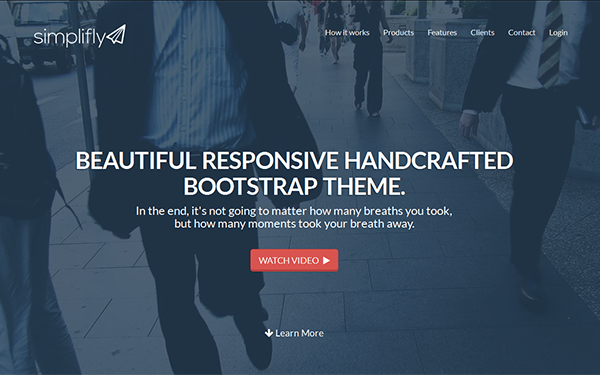 Item Reviewed: Simplifly - Responsive Business Bootstrap 3 Theme 9 out of 10 based on 10 ratings. 9 user reviews.